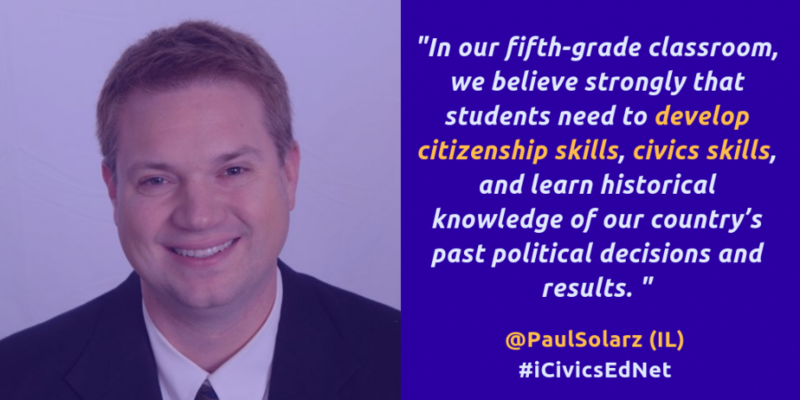 In our fifth grade classroom, we believe strongly that students need to develop citizenship skills, civics skills, and learn historical knowledge of our country’s past political decisions and results. Even when the curriculum hasn’t required it, citizenship for the classroom, community, and country has been an important focus. One example of this was when we planted trees, sang songs, and performed our collaboratively-written play on Arbor Day for our community. Another example was when we worked directly with our mayor & local police to improve the safety of children and families visiting our downtown area through public policy changes. Making time in the curriculum for meaningful community projects like this helps students gain civic virtue and helps them realize that they have a say in their government. There is no doubt that the iCivics games we play in our classroom are highly motivating, extremely educational, and allow the students to apply their learning in a simulated experience. I have integrated many of the games into our lessons, so I have restrictions on which games they’re allowed to play on their own which drives them nuts because they want to play all the games right away at home! Once I give them the freedom to play whichever games they want, whenever they want, they’re beyond excited! Parents start sending emails wondering why their child is spending hours “doing homework” on iCivics and my response is always, “It’s actually not homework – they just want to play those games!” So motivational! These otherwise difficult-to-teach civics concepts are made accessible to my 5th-grade students in ways that are motivating, engaging, and fun! And I couldn’t be more thankful! My students get to play iCivics games after completing the work in our class related to that specific subject. For example, after learning about our Judicial Branch and the Supreme Court, students are given time to complete “Supreme Decision” and “We the Jury.” After playing the games, students begin to prepare for an experiential, whole-class activity where each student gets to become a justice and tries to consider the “common good” while making tough decisions. The decisions come only after students discuss the arguments with their co-justices. They are allowed to have different opinions from their peers but must hear everyone out and then explain their decision in writing. Many students comment that they didn’t think they could ignore their own personal interests, but are surprised that they generally want to do what’s best for most! During each presidential election year, my students participate in a simulation where they each get to participate in a presidential campaign, either as the presidential candidate, vice-presidential candidate, or campaign manager. We never use the real candidates' names or positions on the issues, but rather investigate our own positions and run as ourselves! We complete inventories that tell us which political party we most closely associate with (surprisingly many) and we prepare and perform several “Video Debates” where we pose our stance on a specific issue on video and post it online next to a candidate with the opposite position. Based on the strength of each of these tasks, students move on to the next phase of the election as a presidential candidate, while others become vice-presidential candidates, and eventually campaign managers. Although we are not a competitive classroom, some students show strong political aspirations, while others don’t have the same drive. Therefore, this simulation allows all students to find their niche and become invested in the process. Although disappointing to some, we never actually announce the winner of our election, but instead, use that dramatic moment to “travel into the future” and begin our colonization of Mars in the year 2150 (as we begin to create our own country on Mars while learning about government and the U.S. Constitution). I like to believe that I help my students become people who advocate for themselves and always give 100%. I want my students to have personal drive that helps them become a stronger student today than they were yesterday, but not at the expense of others. I help my students develop true collaboration skills where they notice when others are struggling and they take time out from their work to help. On the flipside, I want my students to learn to ask for help and welcome assistance. Through our everyday activities, students become better friends and eventually start to work as a team. In addition, social-emotional skills are taught, practiced, and improved regularly through formal activities, class discussions, and as things present themselves. I hope that our future leaders develop these skills, as well as problem-solving, creative thinking, and so many other “21st Century Skills” that have been around forever but have never been the focus of school lessons. In our classroom, these skills are the main focus of instruction and assessment, and the curriculum is merely the background on which we get to practice these skills! Get the latest from Paul here. Follow Paul on Twitter here. Check out all the great things happening in his classroom by following his classroom on Twitter here. If you are interested in serving on the iCivics Educator Network or want more information, contact: EducatorNetwork@icivics.org.